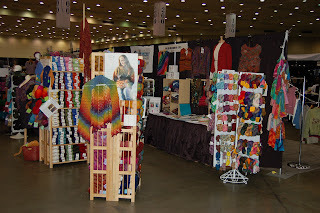 We would like to thank everyone for a warm reception at Stitches East in Baltimore this weekend. We had a great time and were very pleased to meet so many of our customers at the show, both from back home and elsewhere in the United States. The fashion show on Friday night was very inspiring. We have put together a video slideshow which is available on our web site in a new section which also has a video of the Halloween Costume Party and will have videos of all the upcomming fashion shows. Speaking of which. This Saturday afternoon (11-15-08) sometime between 5:00pm and 7:00pm we are hosting a fashion show featuring the garments from the Twist Collective August 2008 and the new (unreleased) garments from the November 2008 issue. If you can't make it in person the video of this will also be posted on our web site. Commentary will be by Julia from The Twist Collective. Visit us at Stitches East in Baltimore Maryland!!!! 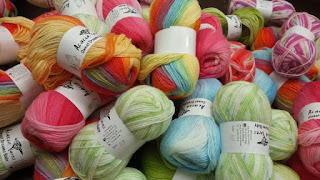 The Yarn and Fiber Company heads to Stitches East in Baltimore Maryland! Here we are in the hotel room waiting to unload a truckload of wonderful and gorgeous yarns! The drive here was nice and quick with some wonderful rain and warmer temperatures to greet us .... it is probably about 10 degrees warmer in Maryland than New Hampshire and the foliage is back for us! Come and say Hi when you are here...we are booth #436 and 438. Lots of great classes, yarns, vendors, and our favorite... the fashion show (Jerry brought his camera so we will post pictures when we can about the cool and fun fashions on display!) 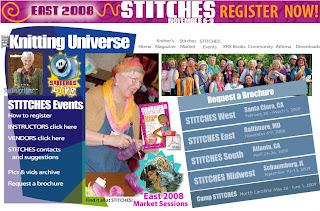 Stitches East info is available here!